Loom Band Crazy is a new website created to help loom addicts find everything they need to create limitless permutations of the popular wristband product. Pointe-Claire, Quebec,, Canada - - April 10, 2014 /MarketersMedia/ — Loom bands are a hugely popular combination of toy, craft and accessory for kids that allow children to use small loops of brightly colored latex-free rubber bands to combine them into braided, plaited and knotted structures that take on a life of their own. For many young children, the starter kit that gets them hooked is soon not enough to serve what their imagination strives to create, and then parents must search endlessly for new accessories, tools and bands. Loom Band Crazy has been launched to bring all the Loom Band accessories together in one place so parents can help feed kids’ imaginations. 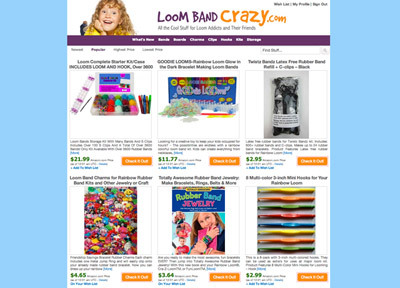 Loom Band Crazy regularly updates their listings in order to provide the latest and best products, and their catalog can be browsed by newest added, most popular, most expensive or cheapest so that individuals can scale the items by what is most relevant to them. They can also search by categories including bands, beads, charms, hooks, kits, storage and more. Every item comes replete with high quality imagery and a detailed product description describing exactly what people can expect from their purchase and how it can be used, and shoppers can even use the wish list function to be notified when out of stock items come back in, or save them for later. Loom Band Crazy is a new destination for those who love rainbow looms to find all the accessories and enhancements they need to unleash the potential of Loom bands to their fullest extent. The site regularly updates with new additions that help loom addicts explore new possibilities.